MONTREAL – The management of SIRIOS (TSX-V: SOI) is pleased to announce the assay results of thirteen drill holes, totaling 3,382 meters, on the Cheechoo gold property. This includes hole #176 that intersected a new high-grade gold zone assaying 6.4 g/t Au over 12.4 m, located at the west-north-west limit of the drilled area. 0 g/t Au over 41.6 m in hole #164. The new high-grade gold zone of hole #176 is located to the west of a set of drill holes positioned in a 100 m grid pattern. This grid pattern was designed to define the large gold halo currently known to cover an area of 1,000 m by 600 m. The intersection in hole #176 extends and opens this area to the west. Additional drill holes will need to be carried out to test for possible extensions of this high-grade zone. Significant drill holes assay results are listed in the table below. 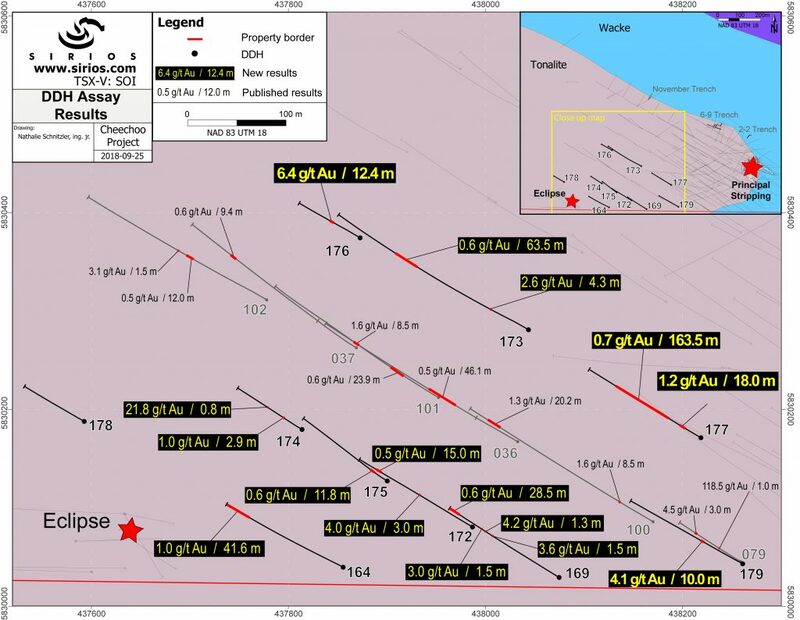 Regional exploration drill holes #167, 170, and 171, located more than 1.5 km west of the Eclipse area, as well as hole #178 did not return any significant gold assays. 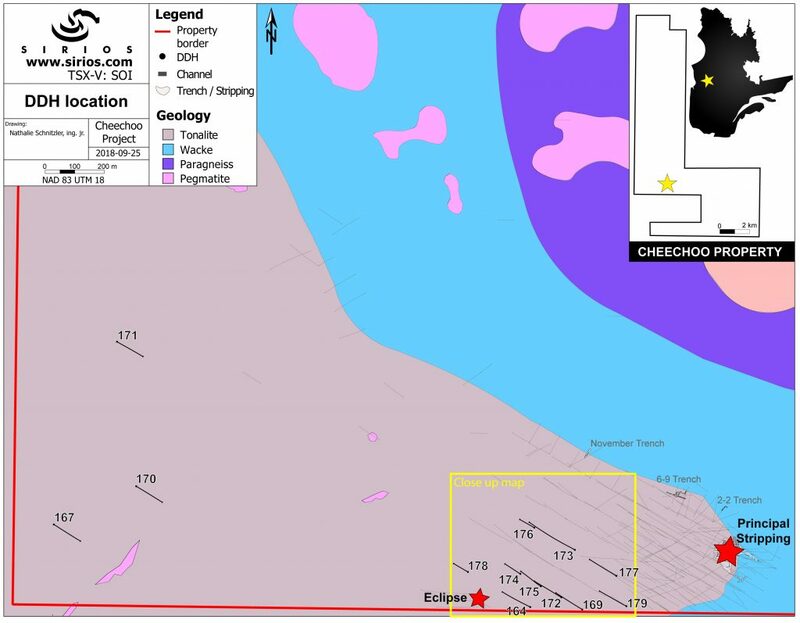 Sirios’ 100% owned Cheechoo property is located in the Eeyou Istchee James Bay region of Quebec, approximately 800 km north of Montreal, 200 km east of Wemindji and less than 10 km from Goldcorp’s Éléonore gold mine. All NQ drill core was described by Sirios personnel at the Cheechoo exploration camp. The drill core was then sent to Rouyn-Noranda to be sawed in half, with one half sent to a commercial laboratory for assaying and other half kept for future reference. A strict QA/QC program was followed by integrating blanks and certified reference standards to the core sample sequence. The samples were assayed for gold by fire assay with an atomic absorption finish by Actlabs in Ste-Germaine-Boulé. Samples assaying greater than 2 g/t Au as well as drill core samples with visible gold were assayed by fire assay with metallic sieve based on a 1 kg sample. Founded in 1995, Ressources Sirios develops its own mining exploration projects. A highly qualified team of engineers and geologists manage all phases of projects, from scientific hypothesis to ground exploration. Pioneers in the discovery of world-class gold deposits in the James Bay region, over the years, Sirios has discovered numerous gold and silver showings in Nord-du-Québec and Eastern Canada. Its flagship project, Cheechoo, is the largest and most promising gold discovery in the history of Sirios. The company also owns other high-potential projects, including Pontax and Aquilon. © 2018 Sirios. All rights reserved.